Thaw your fish paste if it's frozen and add it to a stand mixer (or a large bowl). Mix the fish paste on low until it's springy. Mix in curry paste, chopped lime leaves, and green beans and continue to mix. Season with a pinch of salt and ground pepper. Heat oil in a large pan to 350°F. Once hot, begin dropping in large tablespoon-sized balls of the fish batter. Fry balls in batches for about 3 minutes per side until they are cooked through and nicely browned on the outside. Remove fish cakes to a plate lined with paper towels to drain briefly. Serve immediately with cucumber salad and maybe a dollop of hot sauce. The phrase “Holy Mackerel” now has a completely new meaning for me. That’s because for this recipe I decided to go way outside of my comfort zone and make fish paste from scratch from a whole mackerel. I’ll spare you the gory details, but the good news is that it worked and the results were delicious! The really good news is that you don’t have to do this to make this recipe. You’ll just need to find a good Asian market and ask around for fish paste, which is normally in the frozen section. Once you have that key ingredient, making these kaffir lime fish cakes is really simple. Even though I don’t recommend it, I figured I would show you the photos from me making my own fish paste. Basically, I filleted an entire mackerel, spooned out the raw flesh, chopped into a fine paste, and mixed that paste with salt, pepper, and cornstarch until it was a pasty, springy consistency. This took me about 45 minutes, and the end results were okay, but not anything better than the store-bought version. So my advice, again, would be to just hunt down the Asian style fish paste and use that! While you’re at the Asian market, go ahead and pick up some real red curry paste. While you can normally find this in a grocery store, I find that the Asian markets have more choices and generally more flavorful varieties. The version I used for this dish is Mae Ploy red curry paste. It’s really spicy and delicious and I highly recommend it. The final ingredient that you’ll need from the Asian market is kaffir lime leaves. These are waxy leaves that have a ton of flavor in them. You can skip them for the fish cakes, but I think they add a lot to the recipe. Once you have all your ingredients, add your fish paste to a large bowl or stand mixer and mix it until it’s nice and springy. Season it with a pinch of salt and pepper and stir in the curry paste, lime leaves, and chopped green beans. Your batter should be slightly sticky and very wet. 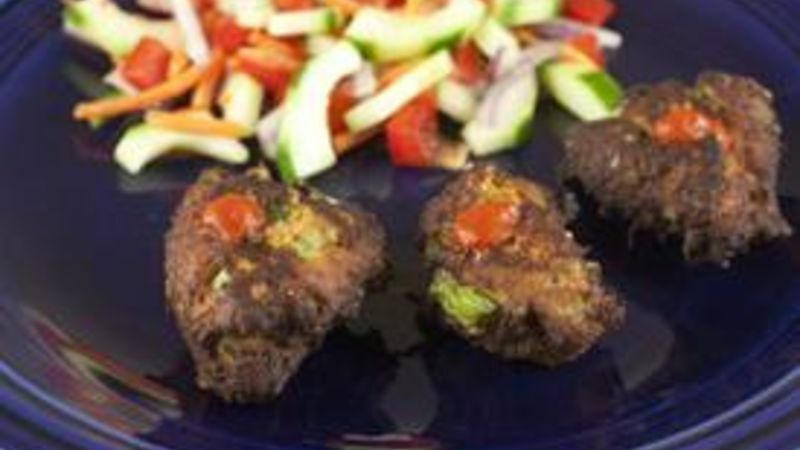 These fish cakes are really spicy and very flavorful, although not fishy tasting at all. To combat some of the heat, I recommend serving them with a light cucumber salad. This is just a mixture of sliced cucumbers, red peppers, carrots, and red onion tossed with some olive oil and rice wine vinegar. Now you just need to fry the fish cakes! I recommend frying these guys in a large high-walled skillet with about ½-1 inch of peanut or vegetable oil. As always, I recommend using a deep-fry thermometer to make sure your oil is the right temperature. I also always recommend doing a test batch just to make sure the batter is well seasoned. This was my test fish cake and I knew it was a success. Once you have everything ready, you can fry your fish cakes in batches. Don’t crowd the pan and keep your oil hot. They should need about 3 minutes per side to cook through and turn nicely golden brown. Let them drain briefly on a paper towel and then serve them with a dollop of hot sauce and the cucumber salad. These only have a few ingredients, but some of them are probably new ones for most Americans. If you have access to a decent market though, get adventurous and give these a shot! Nick got a step closer to proving his universal philosophy that anything mixed with curry paste and fried will be very delicious. Be sure to check out his blog, Macheesmo, and follow him from his Tablespoon profile.